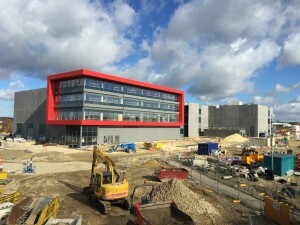 For a £92m production facility in Yorkshire which will produce 48,000 tonnes of sweets a year, there was only ever going to one choice when it came to drainage – Hepworth SuperSleve Clay pipes will ensure this landmark factory will have an underground pipe system that will stand the test of time. The new 30,700m2 Haribo factory in Castleford forms part of the UK expansion of the German confectionary company. With the brand’s rich heritage, of almost 100 years, and a strong vision to be a key player within the confectionery market for another century, clay pipes that offered the same longevity were the order of the day. This led to Hepworth Clay pipes being specified for their inherent strength and low lifetime cost. Hepworth SuperSleve are easy to cut and with the benefit of being able to use recycled aggregate as bedding material, Hepworth clay pipes were the ideal choice and offered the client proven long term performance. For use in commercial or industrial construction, adoptable sewers, highways and general building works the Hepworth SuperSleve system is available in 100mm, 150mm, 225mm and 300mm diameters and consists of plain ended pipe and fittings with additional push fit flexible couplings. The durability of clay pipes is as much an advantage during its service life as it is for installation. With a lifetime jetting guarantee, Hepworth pipes are able to withstand jetting pressure of 7500psi, at 20 gallons per minute held static for five minutes, allowing blockages to be cleared with reduced risk and in less time. Clay drainage pipes also allow specifiers to reduce installation costs as well as environmental impact by minimising the volume of primary aggregate needed from quarries. Clay pipes have tremendous compressive strength which allows their installation with reduced amounts of granular bed and surround, recycled material or even reused as-dug material if suitable. Haribo’s new Yorkshire factory, which marks a £92m investment, has been supported by an award of £6.4m from Round 1 of the Government’s Regional Growth Fund.